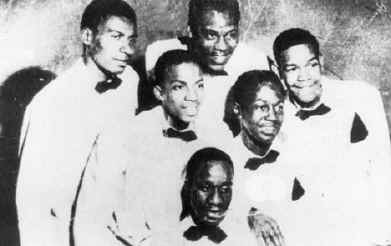 The Spaniels began singing in late 1952 at Roosevelt High School in Gary, Indiana as Pookie Hudson & The Hudsonaires. They changed their name to The Spaniels that spring. By this time they had attracted the attention of local disc jockey Vivian Carter who became their manager. Along with James Bracken Carter formed Vee Jay Records. Upon their graduation signed where they became became one of the first two artists to signed with Vee-Jay Records, the first large, independent black owned record label. 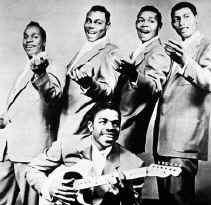 Their initial single first single "Baby, It's You" reached #10 R&B September 1953, which established both the Spaniels and Vee Jay Records.. In early 1954, their Good Nite Sweetheart was a #5 R&B hit. The spaniels became a top live attraction on the national R&B circuit, but 1956 they had undergone many personnel changes. However the group continued the chart with "Painted Pictures" (#13 R&B 1955) and "Everyone's Laughing" (#69 pop, #13 R&B 1957). The Spaniels began fading in the late 50s and shortly after "I Know (#23 R&B 1960 broke up. In 1969 Hudson re-formed the Spaniels. The toured the revival circuit and in 1970 released their last charting single, "Fairy Tales (#45 R&B). In 1991 the Smithsonian Institution's Rhythm and Blues Foundation gave the group its lifetime achievement award. In Spring 1954, "Goodnight Sweetheart, Goodnight" hit number twenty-four on Variety's pop chart, and rose to number five on Billboard's R&B chart. The Spaniels played regularly at the Apollo, The Regal and other large theaters on the Chitlin circuit. The line-up changed numerous times over the ensuing years. The Spaniels were the top selling vocal group for Vee Jay. The band broke up when the label went bankrupt in 1966, but in 1969, the group reformed, releasing hits like "Fairy Tales" in 1970. An entire new generation was exposed to the group's music when "Goodnight Sweetheart, Goodnight" was featured prominently in the movies, American Graffiti and Three Men and a Baby. They have been called the first successful Midwestern R&B group. Some historians of vocal groups consider Pookie Hudson to be the first true leader of a vocal group, because the Spaniels pioneered the technique of having the main singer solo at his own microphone, while the rest of the group shared a second microphone. Two Spaniels groups later performed simultaneously: one in Washington, D.C., and the original group still based in Gary. The D.C. based group, with Pookie Hudson and Joe Herndon, appeared on the PBS special, Doo Wop 50. Hudson died in Capitol Heights, Maryland on January 16, 2007, after a lengthy battle with cancer, at the age of 72. Courtney, Jr. died on September 18, 2008 at the age of 71, after suffering a heart attack.